October 10, 2017--Completed the stitching of this ornament and for picture taking purposes, placed the cut-out oval on top of the canvas to confirm I've got the right shape. Looks good. Now to turn it into an ornament with beautiful cording around the edge. 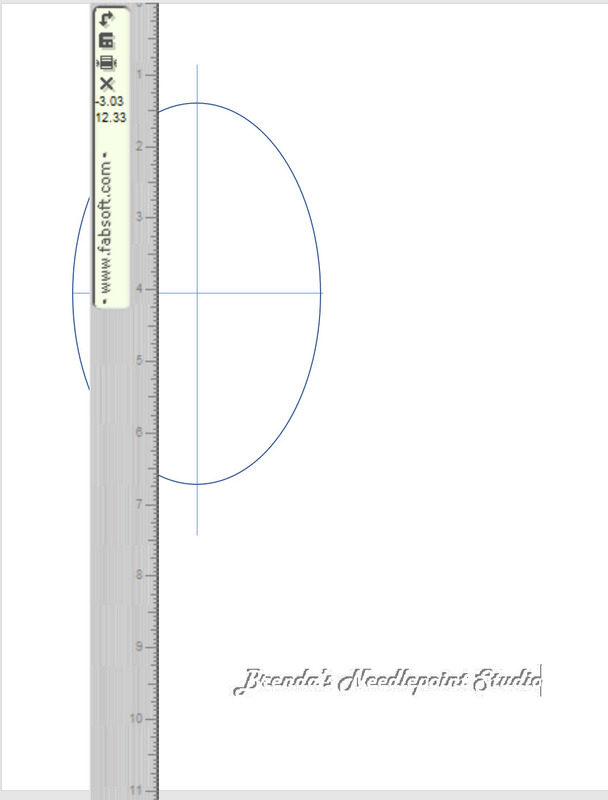 PS The black edge along the oval top is caused by shadow, not a pencil. 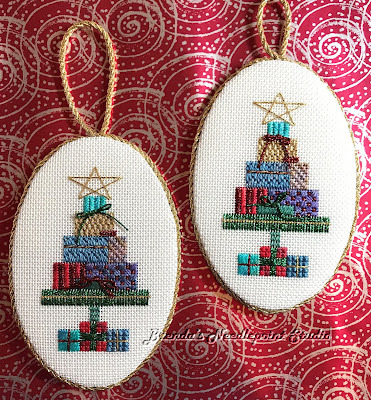 September 26, 2017--I've shied away from finishing ornaments into oval shapes--didn't know how to draw a perfect oval template. Well, no more. 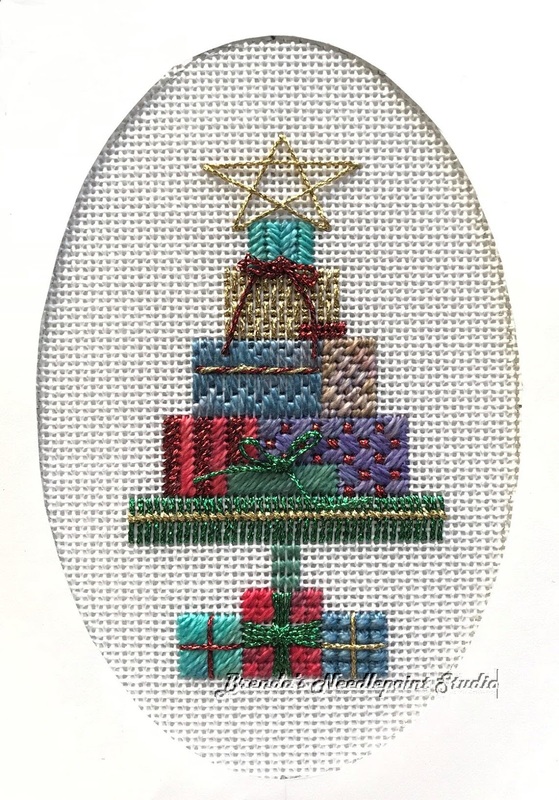 I'm nearly finished stitching the "Trimming The Tree" ornament by Eula C. Malson published in the September, 2003 issue of Needle Pointers, and before I decide to fill in the background with something like the "T" stitch, I needed to pencil in the oval shape on the canvas. Here's what I did. 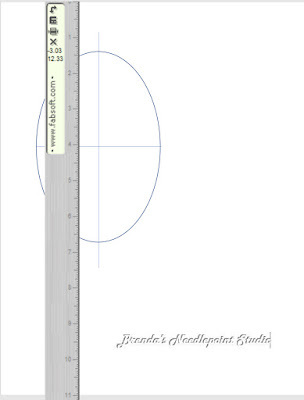 I used Microsoft Word's shapes to draw an oval, then used an old bit of software called "Cool Ruler" to make it the length and width I needed to fit my ornament. 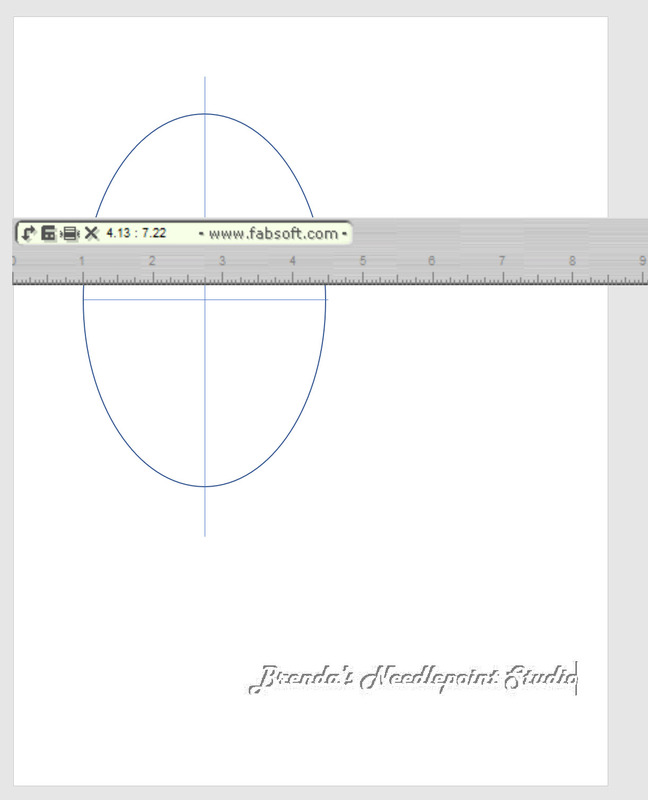 Once the oval shape was set, I used Word's shapes to draw straight horizontal and vertical lines through the middle and printed it out on standard 8.5" x 11" paper. Then I placed my stitched ornament on top of the template, using the lines to help locate the exact center of top, bottom and sides, then drew my oval. Here's a picture of my ornament with a perfectly shaped oval. The top has more space than the bottom because a star will be stitched on top of the boxes after I fill in the background. 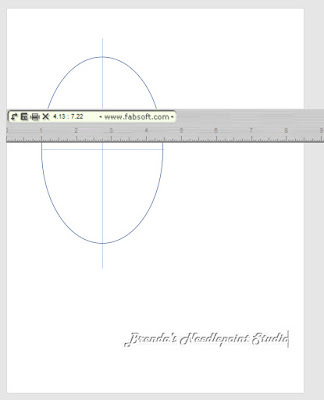 I've used Word shapes for ovals and other geometric shapes too. Very handy! I did find that the printed versions weren't quite accurate though. As I recall they are a tad smaller. Thank you for your kind words. It's easy to follow my blog using Bloglovin (link is on the upper right of my blog page).